My daughter Rachel asked me what I would like for Christmas. I said I would like a Gingerbread Star Trek USS Enterprise. 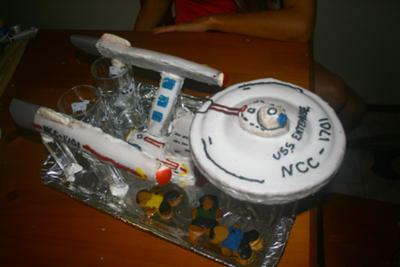 With the help of her brother, Christopher, they made this fantastic model of the USS Enterprise plus some characters. This was their first attempt at both baking gingerbread and constructing it into a model. They were a bit ambitious as they did make it large. Which meant that it had some strength issues. However they managed to complete it in the end. Hopefully you can see these photos. They show the construction of the ship. My daughter did this from scratch using drawings off the Internet as a guide. The main body used an upside down pie dish as a mould. I can't remember what she used for the other parts. The most difficult part was figuring out how to make the engine mounting strong enough. As you can see she had to support the engines with glasses. I think you may need a wooden skeleton to give you the strength you need. In the end it was a great gift. I need the blue prints for this. This is exactly what my Dad asked for for Christmas! I am guessing they didn't really have blue prints so if they have a tip or there is a pic of the underside of the saucer so I can figure out how to best make it stand up, I would be very grateful! Wishing you a wonderful Christmas!